Oh LL, this is beautiful. I've always believed the roof of a sunporch/frontporch should have a blue roof. Very traditional. I can see it now... do you like wicker? IT would be devine. Or a porch swing. I would love to see it done. Oh, Lee Laurie, what a lovely shade for the ceiling. So elegant & warm. It is going to be absolutely perfect when you are completed. My DHs Dad owned a truck exactly like that ... that was one of the best trucks ever. Our children used to love to run down to the corner so when g'pa came home for lunch they could climb in the back & ride up to the house with him. Choosing paint colors can be a nightmare for me too. I like so many different colors. How neat that you got to save some things from your old house, I'm sure it will help to keep the memories alive! What about bringing that pretty blue down to the door? Love that color! Sorry to hear you haven't been feeling well- tried to find the blog on what happened but couldn't seem to find it- Know how it is- I received a bite from a rattlesnake and was in ICU for 5 days and hospital 10 days- am at home on house arrest per dr till Friday when he checks the bite- I keep thinking of all my projects I want to get done and am just sitting here on my bum doing nothing! Sorry everyone. That truck is a fine piece of machinery and I am qualified to drive it. I have the toolkit for it too. w-d 40, crescent wrench, std tools(not metric), duct tape, electrical tape, jug 'o' water and last but not least, a couple gallons of gas in a spill proof can. This kit also doubles as a first aid kit. Duct tape will seal off any gaping wounds. I love the color you are painting the ceiling! That is so pretty! i hope the door fits too, I will be anxious to see it finished! Love the color of that cool old truck too! I love this truck. Funny, your ceiling and truck seem to have something in common. Love your roof. What color will the floor be? Hi love! You and my buddy have been busy bees haven't you? LOL! I like the color of the door but now with the new paint....hmmmm. I need to take my paint swatches out..hee hee hee! By the way, what is my grandfather's truck doing in Mississippi????? Dang, I thought it looked familiar! Oh girl do not get a vehicle with no air conditioner....you'll be a puddle of goo! Hope you and my buddy are doing well and I will give you a call tomorrow for sure. I miss your sweet southern voice! Since we share a Christian blog together, I was in her account with her on the phone with me, looking for some pictures that she took while she was in Florida last week and now she can't find them so here I come to the rescue, find them and put them in her inbox and I don't sign out and go straight to my blog and I thought..I'm gonna go visit Lee Laurie! Marshall says you probably said,"Who in the heck is this?" hahahahaha! I called Farren back and she said I was nuts! OMG...that is just too funny! What a dork! OMG...you posted the comment...I'll never live it down now....!!! LOL! Lee Laurie, I just wanted to let you know I listened to the Jeremy Camp song on your playlist, and I do love it! By the way, you have a great playlist! I listened to several. Oh love the blue ~ your cottage will look so pretty ! 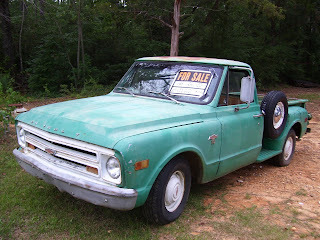 My hubby would love that old truck ! It's no secret that my favorite color is aqua blue. 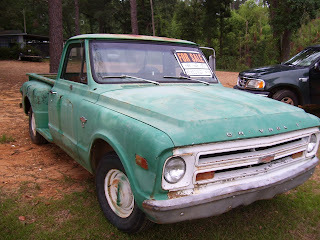 Sooooo, of course I am in love with that old truck. How fun would it be to drive that around (with a.c. of course)! 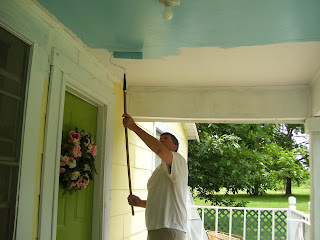 I LOVe your painted porch ceiling! What a great color. And maybe I'm weird, but I kinda like the green door with the blue ceiling. Ohhhh, maybe a coral.That would be pretty too! Maybe for the door color you could go with a sea foam(that'sthe color of my hutch) or robins egg blue, I've been looking at it and trying to figure out a color, LOL, what color will the floor be? I love the blue ceiling. 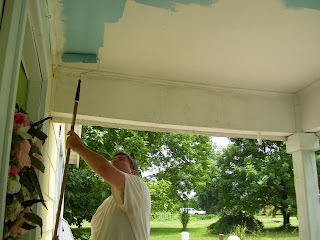 When we get around to painting our porch I plan to paint the ceiling b;ue too. It's the perfect color for it. I love old cars and trucks too; that truck is a beauty! So is your porch color, and I think it's so sweet that you have your childhood door! I would paint it a soft pink. I like your blog background.